Deep cleansing oil with a moisturizing finish that takes away a day’s collection of fine dust as well as heavy makeup. Formulated with mild natural oil to deeply cleanse away everything from fine dust to heavy makeup. Formulated without animal ingredients, mineral oil, imidazolidinyl urea, triethanolamine, silicone oil, synthetic pigment and sulfate surfactant. Mild enough for the delicate eye area and completed HET-CAM test. Known as the purifying flower from the old times, lotus is brought to you containing everything from its root to the flower. The lotus takes root in the mud to grow. It is natural that it is prone to have mud and dirt on itself compared to other flowers that grow on solid earth. Strangely enough though, the lotus always manages to bloom with fresh and clean flowers, thanks to its self-purification mechanism. For this reason people have long been calling this flower the “purifying flower”. 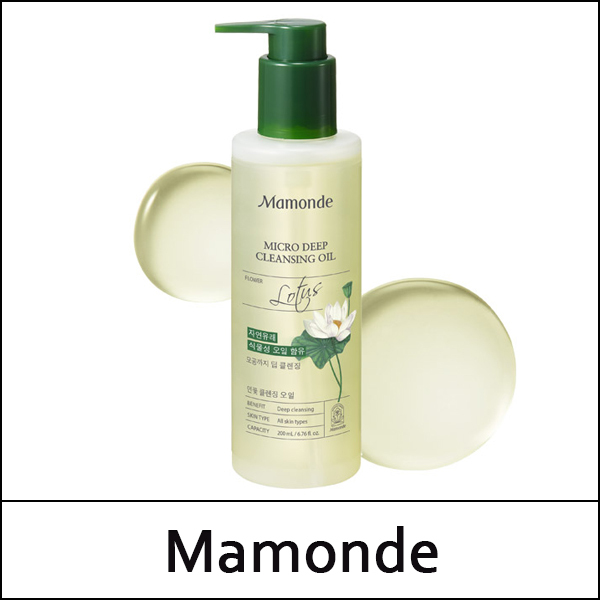 Mamonde delivers the purifying ability of the lotus, which blooms with a clean and white flower in the mud with the Lotus Cleansing line. Begin with dry hands and a dry face. Add an adequate amount into the palm of your hand and massage onto your face, including around the eyes. Rinse off with lukewarm water and massage to help dissolve surface impurities and makeup. Follow up with cleansing foam.